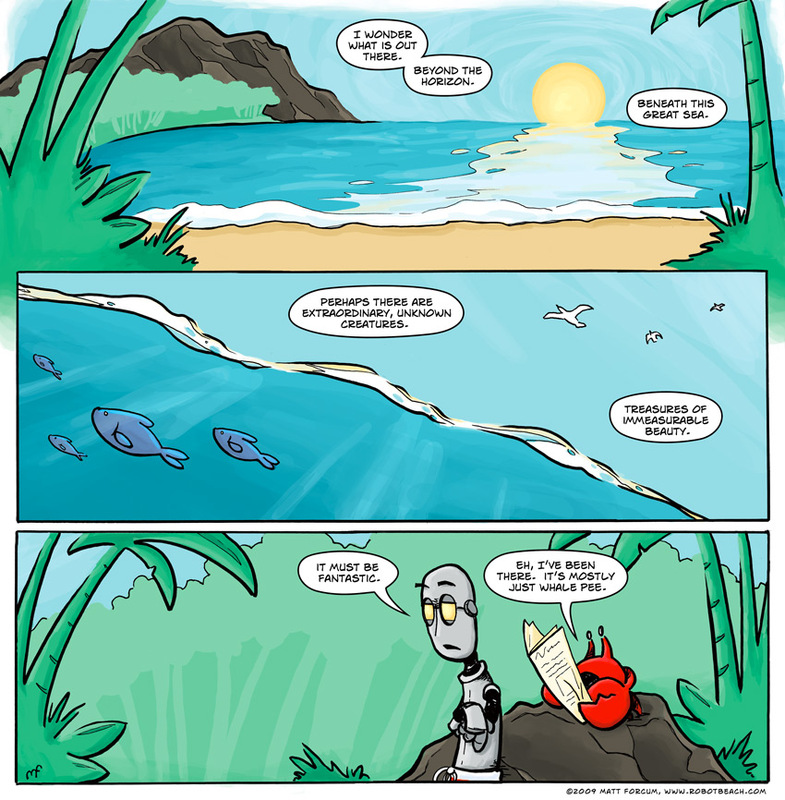 Keeping it classy right out of the gate… Anyway, welcome to Robot Beach! This comic marks the first in a long and exciting adventure for our new friends. I am looking forward to going on this journey and I hope that you will join me for the ride! Wonderful presentation. I love it. Love the site, Matt. Look forward to Annabelle’s Bistro, too. Just getting started with this comic and looking forward to catching up, Tom from Marooned recently recommended checking you out. Hey Chris! Glad you found me! Hope you like what you see! Hey … this doesn’t say it’s for sale and it doesn’t say it’s sold! Is someone hanging onto to it? Yeah, Actually I am hanging on to it. But almost any of these other early comics are available. If you are interested, shoot me an email. The only thing is that they will need to be re-drawn and updated, because the originals in the current condition are not fit to be sold. I plan to have all of these old ones updated and ready to sell before the summer is through anyway. Thanks for the interest!